Innovations in transport have always driven economic growth. This remains true today as our land, water, and air transport systems extend further, and we enjoy ever faster and more efficient transport around the world. 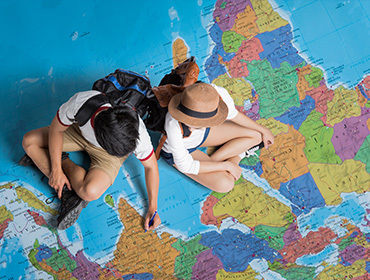 A record 1.2 billion international tourist trips were made last year1 ; the value of goods exported worldwide was US$15.46 trillion2 ; seaborne trade volumes surpassed 11 billion tons3 ; and the global gross domestic product was US$75.6 trillion4 . But what's on the horizon is even more impressive. 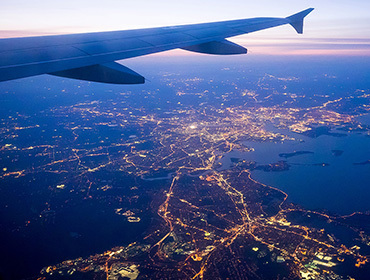 As an airline or mass transit operator, imagine delivering a single mobile platform that your customers use to access all modes of transportation and related services, from accommodation to dining, shopping, tours, local spas and gyms, and more. When they have an important overseas meeting, you'll deliver immediate insight into the fastest transport options, and they'll be able to book tickets and arrange luggage drop-off or drone collection as necessary. Throughout their journey, the customer will always be connected. They will enjoy broadband Internet access at every stage – on the subway, in the plane, and on a train in the remote highlands of a distant country. And this connection will be as fast and as reliable as if they were sitting in their front room at home. When it comes to goods and cargo, the tyranny of distance will be banished once and for all. Drones and automated vehicles of all shapes and sizes will conquer challenging physical environments across land, sea, and air. And every item in every box in every container will be tracked and traced every minute, ensuring rapid, on time, secure delivery. The ongoing digitalization of our transport systems is accelerating us towards this world – a world where railways, highways, waterways, and airways are integrated into a seamless global network. This will make transportation safer and more efficient, dramatically improving the experience for passengers, shippers, and workers in the sector. It will reduce congestion and travel times, cut energy use and make our cities cleaner and quieter. But to achieve these goals will require careful attention to the needs of our customers, and the kind of transportation infrastructure that new technologies are only just making possible. Bridging this gap between possibility and reality will not be easy. Shared standards and safety concerns are two key roadblocks standing between us and a more integrated future. Interoperability is the cornerstone of global networks. Cross-border cooperation on standards and regulations is vital to ensure that our transport networks speak each others' languages. And ensuring safety on every form of transport will depend on the reliability of the electronic data systems that will work alongside the traditional mechanical and electrical systems spanning road, rail, air, and sea. Beyond these two challenges is the issue of how to manage the transformation: the challenge of building new information and communications technology (ICT) infrastructure on top of aged, highly variable legacy systems, while keeping the trains and planes running. Transport networks have to span complex geographies and challenging environments while respecting local history and heritage, and all without compromising the efficiency and safety of the service. Construction of the London Underground began in Victorian times, but this venerable network has yet to achieve full mobile phone coverage. In a modern metropolis like London, this is a stark reminder of the challenges that lie ahead. The transport sector needs to focus on three key advances if it is to respond to the challenges of the future, and remain financially successful. Widespread introduction of CCTV video monitoring across entire transport systems will bring improved safety for people, cargo, infrastructure, and vehicles. This kind of wholesale increase in visibility will require the sector to upgrade its systems from data-oriented to video-oriented. Transport systems will need massive connectivity and massive computing power to handle data from extensive networks of video feeds and Internet of Things (IoT) systems. For transport operators, this means taking advantage of new communications technologies, such as today's Narrowband-IoT and the upcoming 5G cellular networks, along with video management and data center solutions. Nothing will happen without openness and sharing. The sector needs to be able to integrate transportation systems both locally and globally. Working out how to share information between transport authorities, transport operators, and innovators around the world should be a top priority. All stakeholders will need to leverage ICT solutions such as big data, IoT, and artificial intelligence, and flexible cloud platforms will make this possible. Cooperation plus enabling technologies will drive progress and efficiency. Ubiquitous connectivity will be vital to support full digitalization. Over vast distances, complex geography, and challenging environments, transport networks will need broadband wireless links to stay connected and integrated together. For fast and reliable communications, transport operators need robust networks that deliver maximum security and high redundancy, even through severe weather and unstable power supply. Delivering this vision will require the transport industry to work with urban planners, local government, and other infrastructure builders to develop long term plans which will benefit all stakeholders. 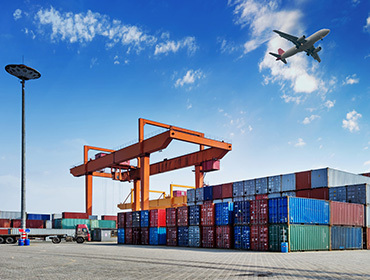 The Internet of Things could generate up to US$1.9 trillion in additional value for the global logistics industry by 2025. In the past decade, China has built 20,000 km of high-speed rail lines, 65% of the world's total high speed rail network. Even more impressive, China's rail network delivers passengers and cargo safely and efficiently while spanning some of the most challenging environments on the planet: mountains, rainforests, deserts, and ice fields. Advanced Optronic Devices (AOD) is the world's largest supplier of LED street lights. Its LED lights are designed for outdoor, commercial, and industrial use.